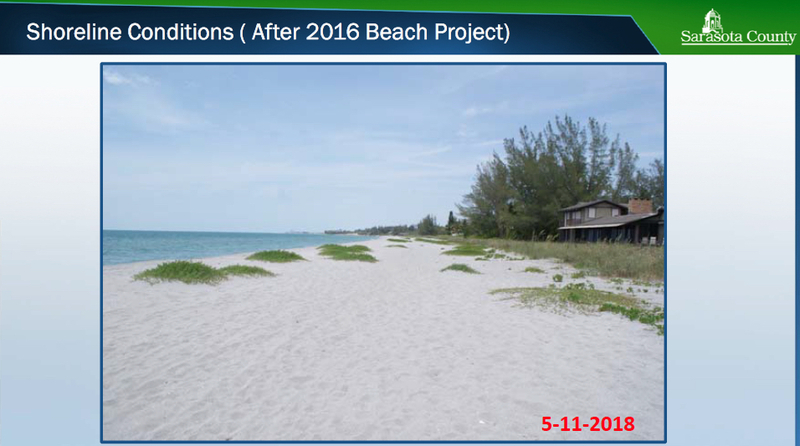 On a 3-2 vote, the Sarasota County Commission has approved a Coastal Setback Variance so owners of a home on Heron Lagoon in the Sanderling Club can demolish it and construct a new home on the Gulf of Mexico that will be 111.2 feet seaward of the county’s Gulf Beach Setback Line (GBSL). Commissioner Michael Moran made the motion, with a second from Commissioner Alan Maio. 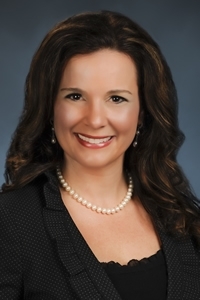 Although Commissioner Paul Caragiulo asked several questions of William W. Merrill III of the Icard Merrill firm in Sarasota — the applicants’ representative — Caragiulo announced that he would join Moran and Maio in supporting the motion. Chair Nancy Detert and Commissioner Charles Hines were in the minority. 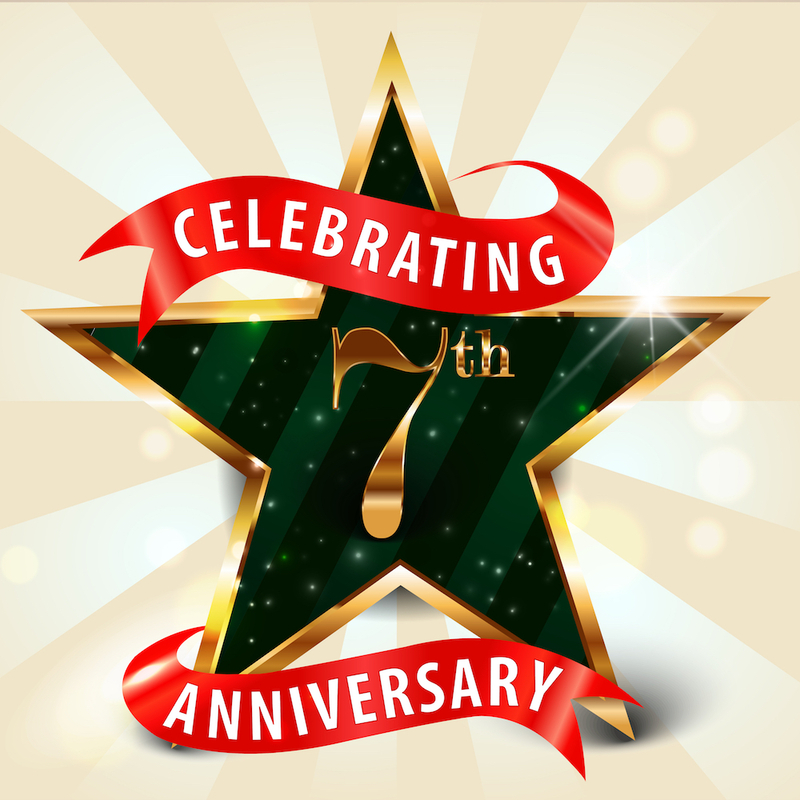 Since he first was elected to the board in 2012, Hines has held steadfast in opposing requests for residential construction seaward of the GBSL. 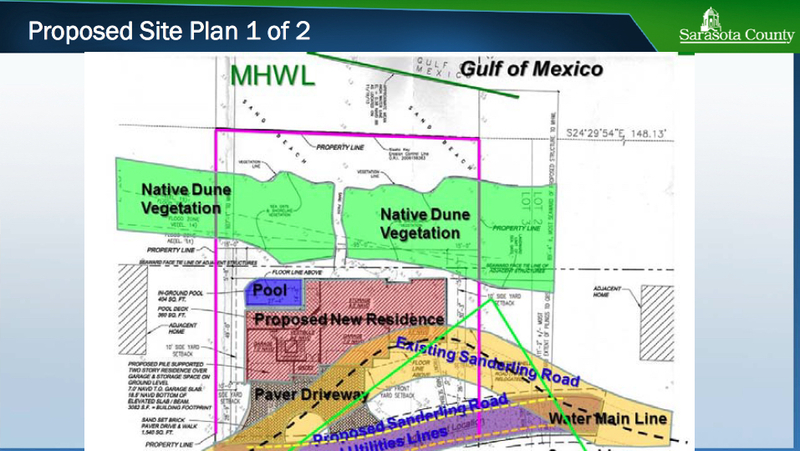 County Environmental Permitting Division staff members have explained on many occasions that that line was implemented to preserve dunes and beach vegetation, which provide protection to landward property in the event of major storms, including hurricanes. Merrill noted in his presentation that the applicants for the variance, Todd and Sean Bavol-Montgomery, bought the property at 8445 Sanderling Road about five years ago. Caragiulo noted the “50% Rule” of the Federal Emergency Management Agency (FEMA), which says that if the owner of property in a flood zone wants to spend more than 50% of the value of that property to improve it, the owner must bring the structure up to the current building code standards for property in that flood zone. Merrill responded that the on-grade foundation would not support a new structure in the very same footprint that would comply with the current FEMA guidelines. 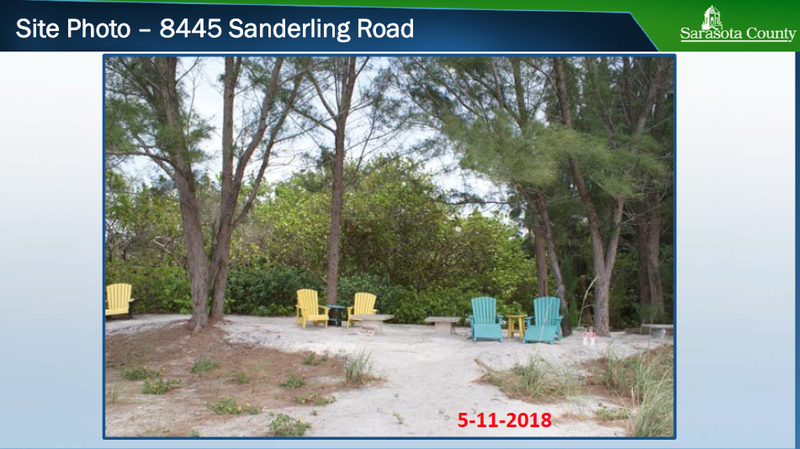 If the petitioners had to adhere to all the current county and Sanderling Club setback restrictions — without seeking a variance — Merrill pointed out that the only area left for them to build on would be an “irregular-shaped lot” comprising 1,138 square feet. 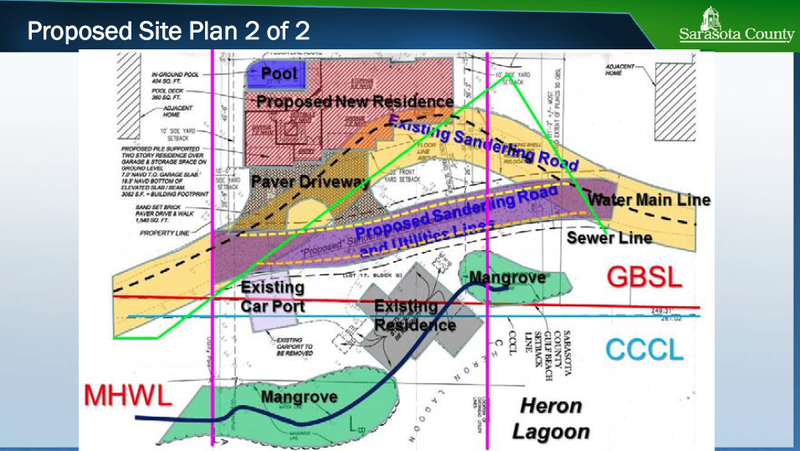 Part of the plan entails a realignment of a portion of Sanderling Road, which bisects the Bavol-Montgomery property, “splitting it into about equal gulf-front and bay-front areas (each about 12,819 [square feet]),” a July 11 staff memo explained. The petitioners will pay for the relocation of the segment of road on their property and partly on the property owned by Robert Roggio at 8440 Sanderling Road, Merrill said. They also will bear the expense of upgraded county utilities that run along that portion of the road, he noted. He and his clients have worked closely with Spencer Anderson, director of the county’s Public Works Department, on that aspect of the project, Merrill added; the project will not disrupt utility service. One factor that Maio noted in offering his support of the project was testimony from Roggio. She noted that she was speaking on behalf of Jeffrey Roberti, who owns the adjacent Gulf-front property at 8448 Sanderling Road. Cason stressed to the commissioners that the Bavol-Montgomery property has “direct access to the beach,” with a picnic area and a recreational area on the Gulf. “They have a private beach in their front yard,” she said. Cason was one of four people who testified against the proposed project, including James Toale of Sarasota, an attorney representing Sanderling Road property Keith Monda. In his rebuttal, Merrill showed the commissioners an aerial photo illustrating that his clients’ house will be more landward and smaller than the Roberti residence. His clients plan a house with a footprint of 3,082 square feet; it will be two stories over parking, he pointed out, comprising 3,950 square feet. The Roberti house comprises 4,950 square feet, Merrill said. Further, Merrill noted, all the pine needles on the ground will be removed by hand. He called those needles “remarkably plentiful and very toxic,” just as the pines’ root systems are, he added. The pines also encourage erosion and prevent the nesting of sea turtles, Merrill noted. His clients will pay for the planting of new native vegetation, he said. 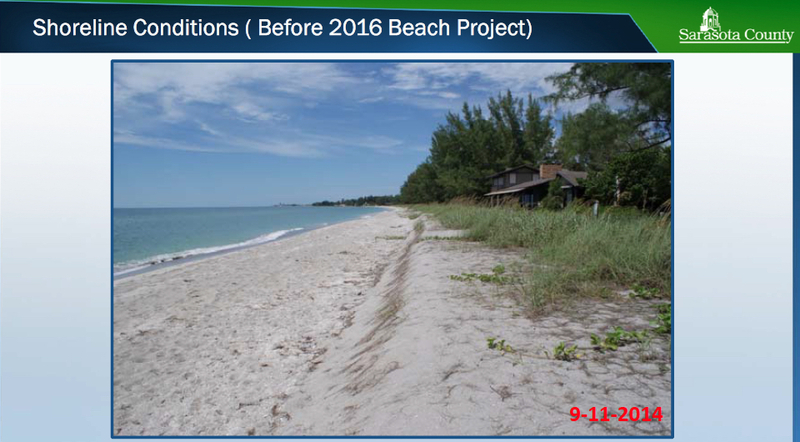 The construction would not adversely affect the coastal systems, Merrill stressed, which Lin of the county staff also pointed out. With a pool, pool deck, driveway and pavers, the total impervious area of the Bavol-Montgomery project will be 5,431 square feet, Weiqi Lin of the county’s Environmental Permitting Division told the commissioners. The latter construction would be seaward of the GBSL, Lin said. However, the lot coverage would be only 22%, which is below the 50% maximum allowed in Siesta Key’s zoning regulations, he added. 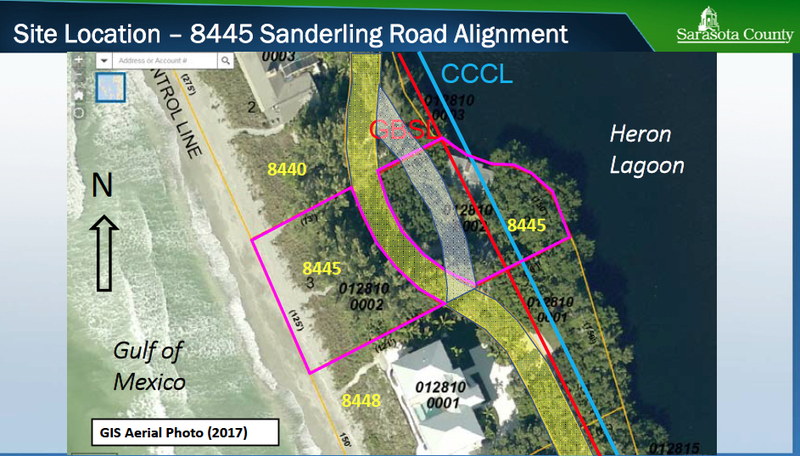 To provide for the construction of the new house, he noted, the plan calls for shifting part of the road 37 feet to the east; the road’s footprint would be reduced from 4,107 square feet to 3,365 square feet across the 8445 Sanderling Road property, Lin said. 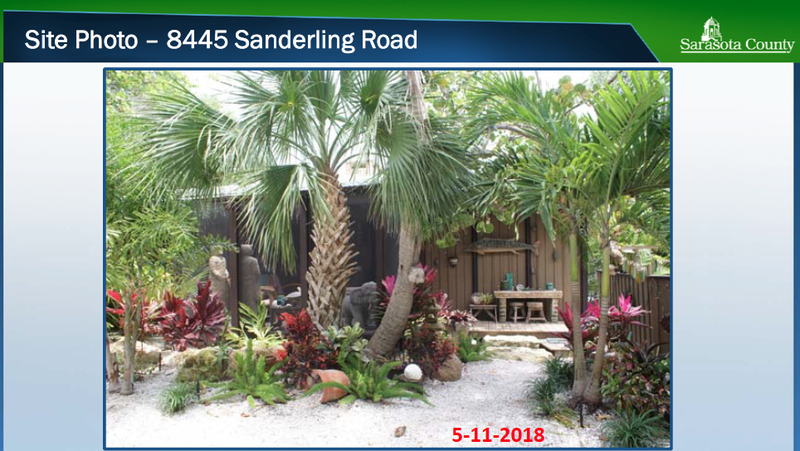 Another segment of the relocated road will extend 45 feet to the north onto Robert Roggio’s property at 8440 Sanderling Road, Lin pointed out. 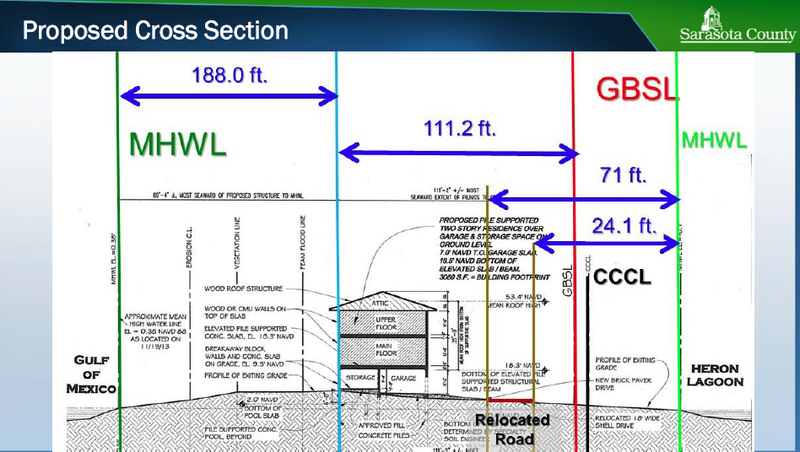 During his presentation, Lin explained, “This variance petition is very unique.” He showed the board slides of the existing house on Heron Lagoon, the road and the Gulf-front portion of the property. 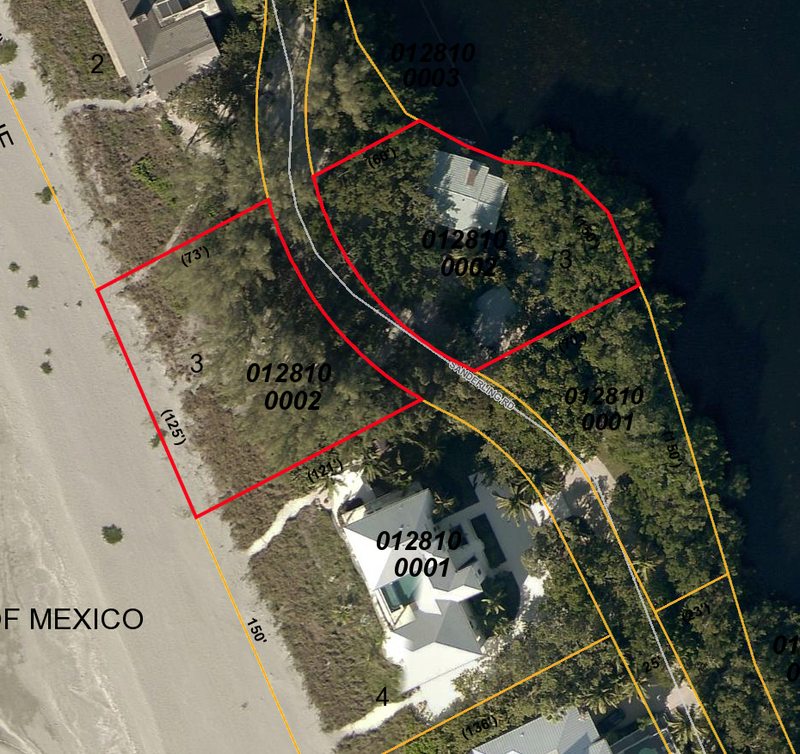 Lin further explained that about 90% of the property at 8445 Sanderling Road is seaward of the GBSL.